Angklung is a Sundanese traditional musical instrument, and is typical of people of West Java, Indonesia. Angklung itself, it is said, existed before the existence of the Sunda’s kingdom. Angklung usually played as a ritual rice planting time arrives. In fact, angklung has been declared as a world cultural heritage, with the category of Cultural Heritage Masterpieces of the Oral and Non-material, by UNESCO in November 2010. The main raw material of angklung is the bamboo. In Sundanese bamboo called “awi”. Not all species of bamboo used as raw material of making angklung. 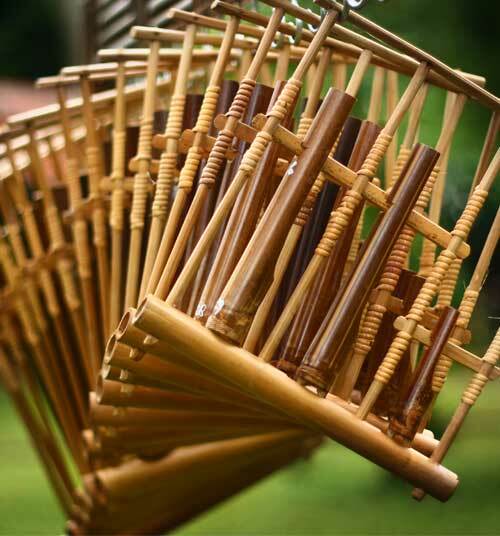 Black bamboo that has aged over 4 years is the best material to make angklung. That, too, must be cut down in the dry season, so that bamboo does not have high humidity, then the angklung will produce good sound. Making angklung begins by cutting bamboo along the 2 span hands of adult. Once cut, place the bamboo in a standing position. 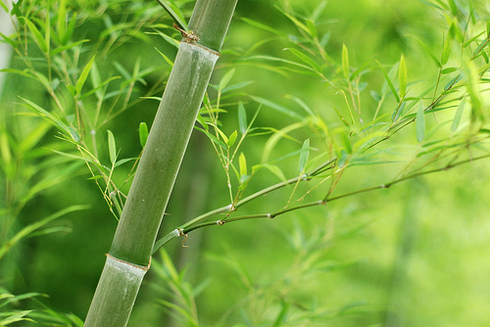 Do not put bamboo on the ground, because the soil moisture will affect the quality of the bamboo. By laying the bamboo in an upright will make bamboo leaves will dry up, and fall by itself. Go to the second stage, that is fumigation with fire. The purpose of the fumigate bamboo with fire is to make the bamboo becomes completely dry. But be careful, do not fumigate bamboo too close to the fire. It could burned the bamboo. When bamboo is completely dry, it will produce a loud sound. After that, cut the bamboo into symmetrical pieces, according to the level tone you desired, and then adjust the height. Then angklung is ready to use. In one angklung there can be two to three tones. Therefore, angklung sounded by shook it. To make angklung is actually easy. But not as easy as has been written on this article. It still remain accuracy and diligence. The famous place of producing angklung in Bandung is ‘Saung Angklung Udjo (SAU)’ (I will review about Saung Angklung Udjo in next article). This entry was posted on Wednesday, November 9th, 2011 at 7:09 am	and tagged with angklung, bamboo, music, SAU, Saung Angklung Udjo, Sundanese, traditional, UNESCO and posted in History, Souvenirs. You can follow any responses to this entry through the RSS 2.0 feed. Hi there. May you always follow my blog, and hopefully my article many benefits for you. My site is Healthy Cholesterol Foods. The info on this post is handy. Okay post, but not the best Ive seen exactly. You should step it up or gulrot will eat your position. HeHe thx for your advice. n I like carrot cake. yumm!